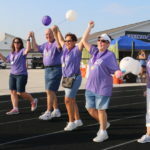 Congrats all around to the cancer survivors, family, and friends who participated in the 18th annual Clinton County Relay for Life on Friday, August 3, 2018. Their commitment to walk raised an incredible $88,571! Over 18 years of the event, our local Relay for Live participants have raised nearly $3.5 million. The evening event took place on the track at Central Community High School in Breese. The evening began with recognition of 125 survivors from Clinton County, followed by a Survivor’s Lap. 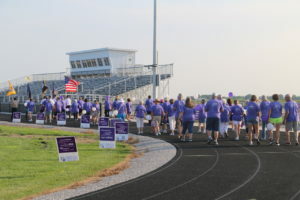 The activity continued until 10:30 p.m. with individuals and teams walking to raise money in the fight against cancer. 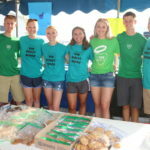 17 teams participated in the walk and also set up booths selling food, drinks, and raffle items to help raise money. Kudos to the top team, J-Putt’s Lucky Crew, who raised $6, 848. Other top teams included Central Football Team ($4,896), DK Crue ($3,476), The Bailey Bunch ($3,301), and Greg’s Gang ($3,033). 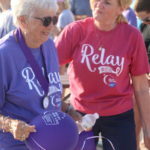 A special Luminaria ceremony, lit by 310 brightly shining lanterns, was also held to honor loved ones lost to cancer, celebrate the survivors, and to show those who are affected by the disease that they are not alone. Attendees lined the track as names of those honored were read aloud. A special recognition and plaque was given to the Speedy Benhoff Family and Friends for making a $20,000 contribution. Benhoff, a dedicated Relay for Life committee member, lost his battle with cancer this past June. A special shout-out and thanks to the dedicated committee members who volunteered their time and talents to make the event such a success. This year’s impressive turnout is indicative of our community’s passion and caring. What a wonderful place Clinton County is! This entry was posted in Announcements, Events and tagged Clinton County event by admin. Bookmark the permalink.